One of us is a Jew. One of us is a Muslim. 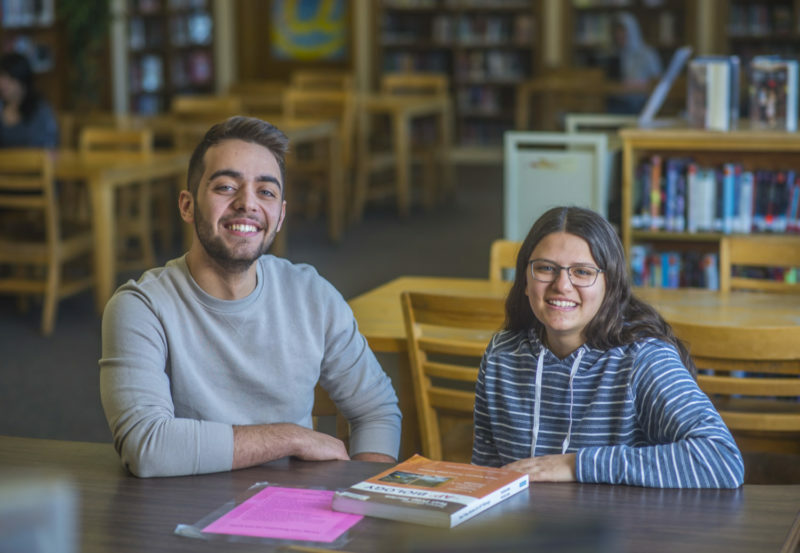 And this is our story of building a genuine friendship through Jewish Student Connection (JSC) at South High School in Denver – the only Denver Public School with a Newcomer Center serving refugee students who have limited or interrupted formal education. We share our story not to be patted on the back, but to serve as a model of what happens when teens are empowered to lead and are given the space to learn and grow together. One of us, Eliana Goldberg, started JSC at South during her freshman year (four years ago). At first, the club wasn’t in high demand. We had about six students coming to most of our meetings. We knew we needed a different strategy to build momentum and gather members. And so we took a different route. We reached out to the Muslim Culture Club and invited them to start coming to our meetings. In fact, we invited anyone we could talk to about our meetings. Each meeting started with a simple exercise: we asked everyone who attended what they wanted to know about Judaism, and that served as our topic for the next meeting. An especially popular area was learning about Torah numerology. The club became a popular place for many students of all backgrounds to learn about Jewish life, culture, and more. We welcomed all students with open arms because that’s what our generation does. If we want people to see our best selves, and our best Jewish selves – as people who are respectful and embrace diversity – we have to live it. And so, every couple of weeks since the club’s founding, we’ve gathered to share stories, share food, and to learn together. Over time, the club grew to be a platform for exploring and learning in an open, safe environment. We have 72 nationalities represented at our high school – with all kinds of questions. Last year, the other one of us, Marwan Nassr, an Iraqi Muslim refugee who fled to Syria and then to Turkey, walked into the club. Where Marwan came from was completely devoid of friendly interactions with Jewish people. Marwan was told things about Jewish people that gave a certain impression about who Jews are and what they believe in. And then he met Eliana. He was skeptical when she invited me to JSC. But she offered free pizza. And so even though he was worried and thought he would feel like a stranger, Marwan went. He never felt so welcomed before in his life. Marwan felt that he was one person before JSC, and another person after. He got to ask questions and do something so simple: meet people. We’re the largest club on campus now. 65 students strong. We put people in an environment where there’s no judgment and ideas aren’t pushed on people. Our club is a place to relax. We don’t dictate how to do or how to be Jewish, or what to believe. We frame conversations with “This is what I think” and “If you want to learn.” Teens live in a world where so much is dictated to us. We don’t need to impose that on each other. We connect with each other in fun ways and then also delve into serious issues and explore even real divisions that may exist. No question is off limits. We are blessed to have a diverse culture at our high school. People have had struggles. But all people should be met with the same respect. And our differences and similarities should be explored freely. Our club is part of our high school’s culture of developing young people ready to lead and create positive change. So we want to be part of creating that change. Because of JSC, we are now close friends. By taking time to meet and then to understand “the other,” we have built a wonderful friendship. We know we have differences, and we know what those differences are. And that’s great. We hope our experience can serve as an example during these times that feel incredibly divisive. Our goal is to show that it’s not hard to create these interpersonal connections. Start with a small connection or act of kindness to welcome people in and engage them. Give options, give freedom of choice, to learn and interact with people. Sharing beliefs builds genuine friendships. The Jewish community has taken huge strides in breaking social stigmas, working with other cultures and really connecting. We think we can go even farther, to work with other people, and break down more barriers. If we can do this at our high school, we think it’s possible for everyone. The National Education Policy Center Schools of Opportunity Recognition Program has recognized the school as one of only eight in the nation creating remarkable learning opportunities for all students. Rose Community Foundation is helping JSC expand its presence in Greater Denver middle and high schools through support from the Jewish Teen Education and Engagement Initiative. The initiative – a partnership between Rose Community Foundation, Jim Joseph Foundation and other donors – is designed to engage more Jewish teens in innovative Jewish experiences. Denver/Boulder is one of ten communities that are a part of the Jewish Teen Education and Engagement Funder Collaborative.